So I feel that we've dodged a bullet here — "Language Log" might well have translated as "Do not leave You are a loser". But it didn't. I've come across traces, in memoirs and fiction, of a style called "telegraphese," in which "to Chicago" becomes "Chicagoward" and "as soon as possible" becomes "soonest," etc. This was presumably a way of saving money when Western Union charged by the "word," however they defined it (apparently "ASAP," being an abbreviation, was considered four words, hence "soonest.") I've tried to find material on this on the Web but could find only the much more difficult codes described in the post. Anyone know more about this? 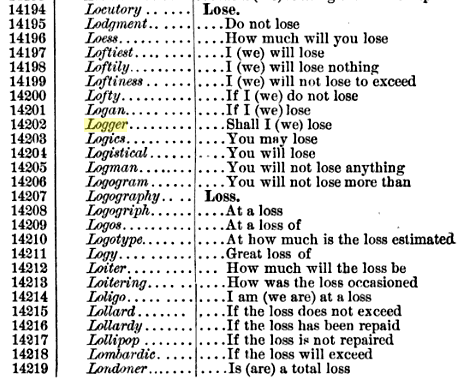 Why use a long word (locutory, logography) for a short one (lose, loss)? It doesn't look to me as if those are equivalents meant to be used; they are set off typographically, and appear to be headings. The idea appears to be "Everything between locutory and logography involves the word lose." On the other hand, this may be as much a code as a money-saving device, so perhaps you would say locutory for lose to hide your meaning. UPI and its predecessor United Press was famous for requiring telegraphese: its informal motto, "Downhold expenses", is actually written in this jargon. See also the O. Henry story Calloway's Code. We've moved from the need to save money with telegraphese to the need to save time with textese. I like the anecdote about Cary Grant getting a telegram "HOW OLD CARY GRANT" . He replied "OLD CARY GRANT FINE. HOW YOU". There must have been some confusion between STOP meaning "cease" and STOP meaning "." Was there no punctuation? What was a "?" ? Or rather "OLD CARY GRANT FINE STOP HOW YOU STOP" I suppose. This material seems old enough to be out of copyright. If so, Project Gutenberg might be interested in transcribing one or more of these books, or they may have done so already. And again, if so, it would be available as somewhat formatted ASCII suitable for trivial processing into an amusing dictionary of the kind conceived by Mark. I'm not interested in manually typing tens of thousands of these definitions, but if that donkey work is done and someone points me at it I'm quite happy to knock together a web site where visitors can enter words or sequences thereof and get them translated. I already have hosting for various other projects, and it's no more than an hour's work I should think. A suitable contact email address is used to post this comment. Aha! Now I know how we can fill all those hundreds of not-yet-allocated status response codes in Hyper-Text Transfer Protocol! Slight impediment to using the text: there's a fine "hand scan" on page 403 of the Google Books copy. As a Londoner I object very strongly to the imputation in the codebook listed above. 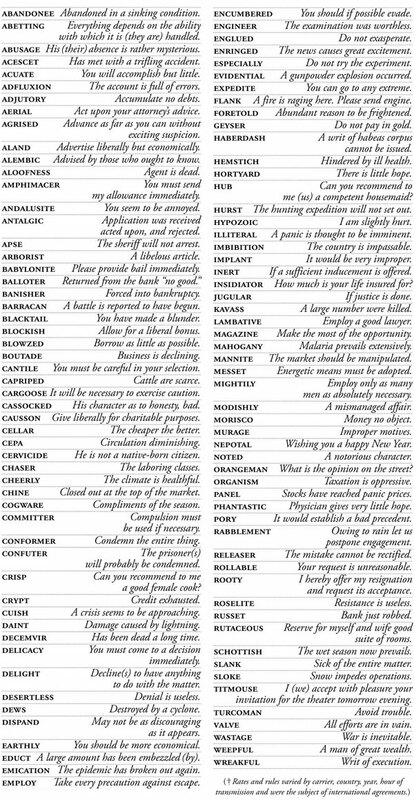 My favorite bit of telegraphic economy is: "Upshove job asswards."